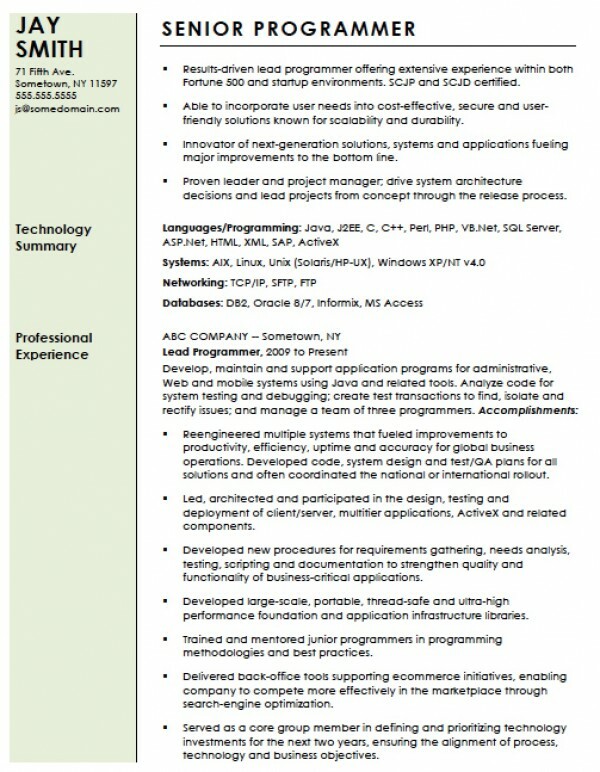 The professional computer programmer resume template is a document to be used by specialists with over five (5) years of coding or specific language expertise. Also known as a ‘senior programmer’, the individual is most likely to be appointed to head a project or be managing other coders/programmers as part of a company or team. The individual should list any and all languages that they know along with experiences, jobs/roles, internships, and education they have. Step 1 – In the upper-left portion of the resume include the candidate’s name, address, telephone, email, and links to any social media accounts such as LinkedIn. Step 2 – To start provide a bullet-style paragraph with the major accomplishments in your career such as projects you were apart of, companies worked for, and any other credentials that should be mentioned before providing your standard work experience. Step 3 – List the total amount of coding languages, systems, and databases that you specialize or have knowledge. Step 4 – List your previous job(s) and the everyday experience. Be sure to explain your exact role and list the applications, software, or projects you had completed. Step 5 – List your education including any college undergraduate degrees, masters degrees, private organizational commitments, and seminars that you have completed. Step 6 – List any other types of credentials that you feel should be mentioned such as volunteerism or skills you have required outside of programming that would benefit a company or institution.